SUBHEAD: Federal court order restricting Trump's ban on "Muslim" immigration being ignored by DHS. Image above: Protest in Seattle against Trump immigration ban. From original article. Hours after a federal judge issued a stay on President Donald Trump's executive order temporarily restricting entry to the U.S. from seven Muslim-majority countries, the Department of Homeland Security (DHS) and a senior White House adviser issued robust responses, emphasizing that the order remains in force. In a statement issued in the early hours of Sunday, the Department said: "President Trump's Executive Orders remain in place — prohibited travel will remain prohibited, and the U.S. government retains its right to revoke visas at any time if required for national security or public safety." It added that the department will "continue to enforce all of President Trump's Executive Orders in a manner that ensures the safety and security of the American people." In addition, Stephen Miller, a senior adviser to the White House, told the Associated Press that nothing in the judge's order "in anyway impedes or prevents the implementation of the president's executive order which remains in full, complete and total effect." The responses came just hours after federal Judge Ann Donnelly of the Eastern District of New York granted an emergency stay on parts of the order late Saturday. Her ruling came in response to a lawsuit brought by the ACLU on behalf of two Iraqi refugees who had been detained at New York's John F. Kennedy airport. The stay will prevent the government from deporting citizens from the affected countries that had already arrived in the U.S.The ACLU estimated that around 200 people would be affected by the ruling. For travelers outside of the U.S. however, even those with valid visas, the ruling will not change the restrictions imposed on them by the order. Who is affected by Trump's executive order? Citizens of seven Muslim-majority nations - Iraq, Iran, Syria, Somalia, Sudan, Libya and Yemen will be prohibited from entering the U.S. for 90 days. Green card holders from any of those countries currently outside of the U.S. will need to report to a local U.S. consulate for "extra vetting," and admitted or rejected on a case-by-case basis, according to administration officials. Refugees seeking asylum in the U.S.: All refugees will be banned from entering the country for 120 days. Refugees from Syria will be banned indefinitely. Anyone with U.S. citizenship will not be affected. A DHS spokesperson on Saturday told the Associated Press that foreign-born U.S. residents who could have been barred from re-entering the United States under Trump's immigration order have been allowed back into the country. The official said all green card holders from the seven countries who sought to enter the U.S. Saturday were granted special permission. Not all aspiring immigrants have been so lucky, however. Since the order has been in force, stories have been emerging about families and individuals aiming to rejoin their loved ones being refused entry to the U.S. While a dozen travelers were being held at New York's John F. Kennedy International Airport on Saturday after they arrived, many more across the world were told they would not be able to board connecting flights to their destination in the U.S.
Amir Rashidi, an Iranian immigrant who lives in Seattle, told NBC News that his mother — who had become an American citizen — sponsored his sister's family to come to the United States. They had all obtained green cards, a process that can take years. All but one arrived safely in Seattle. Rashidi's niece, 27-year-old Mahsa Fazmali, was slated to arrive on Friday, but then Trump signed the executive order. Fazmali flew without a problem from Tehran to Dubai, and she had even found her seat on her flight to the Emerald City. "She was on the plane sitting on her seat," her uncle said. But then her name was called over the PA system and she was ordered to deplane with her belongings. According to Rashidi, airport officials could not explain why her green card would not allow her to travel to the United States. She and the other immigrants who were looking for answers only learned of the travel ban from a nearby television turned to the news. Fazmali then flew back to Tehran. The DHS said the court order would not affect the overall implementation of the White House order and the court order affected a small number of travelers who were inconvenienced by security procedures upon their return, Fox News first reported. As reported before, just before 9pm on Saturday, U.S. District Judge Ann Donnelly in New York issued an emergency order temporarily barring the U.S. from deporting people from nations subject to President Donald Trump's travel ban, saying travelers who had been detained had a strong argument that their legal rights had been violated. 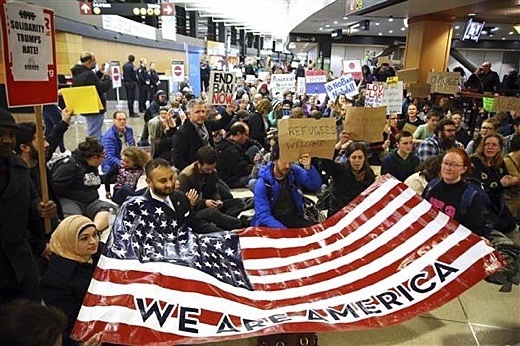 The stay was ordered after lawyers for the ACLU filed a court petition on behalf of people from seven predominantly Muslim nations who were detained at airports across the country as the ban took effect. However, an official with the DHS said Saturday night that no green-card holders from the seven countries cited in Trump's order had been prevented from entering the U.S. Trump also billed his sweeping executive order as a necessary step to stop "radical Islamic terrorists" from coming to the U.S. It included a 90-day ban on travel to the U.S. by citizens of Iraq, Syria, Iran, Sudan, Libya, Somalia or Yemen and a 120-day suspension of the U.S. refugee program.